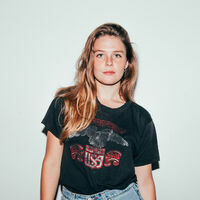 With just two self-recorded, home-produced albums and a single viral hit to her name, Maggie Rogers is a product of the modern age in music where, through Internet exposure, artists can achieve worldwide recognition in a very short time. Her album The Echo, recorded in 2012 is a compilation of ten songs which Rogers used as part of her application to attend The Clive Davis Institute Of Recorded Music in New York. Having secured a place at the Institute Rogers went on to record her second album Blood Ballet in 2014. Both albums are written in a folk-influenced, indie style. Whilst on a studying trip to Europe the artist's exposure to electronic music led to a change of style and the creation of the song Alaska, a piece written about her experiences with R&B producer Pharrell Williams. A video showing the emotional response of Williams listening to the track went viral resulting in hundreds of thousands of plays of The Echo and Blood Ballet. The level of interest generated by Alaska prompted Rogers to release a finished version of the song.